At our shop at 25 Burgate, Canterbury we are pleased to be stockists for some leading collectible craft brands. In many cases we are the only outlet in Canterbury, or sometimes Kent, for these. These ranges are not normally available for mail order. So please come in to Canterbury and browse. We look forward to welcoming you. This attractive range of home accessories are designs of animal characters, each of which are the creation of Angela Stevens, who founded the company in 1991. These are available as doorstops and paperweights, and are made from high quality jacquard fabric. These beautiful textured mirrors and candle holders are inspired by England's wealth of architecture. 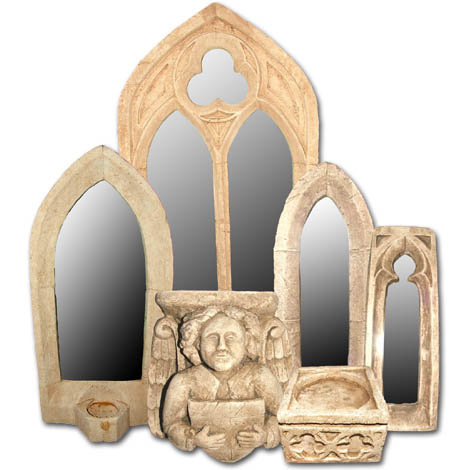 The mirror surrounds are reproductions of Gothic windows and other elements of stone carving, looking and feeling like reclaimed stone and serving as a focal point in any room or outdoor space. Available exclusively from Canterbury Cathedral Shop, this aromatic amber bitter is brewed from the finest floor malted barley and Kent hops at Bleangate Brewery in Herne near Canterbury. In the medieval period the monks brewed beer as the water was unfit to drink. We also have selections from Ashleigh and Burwood, Pitkin, and Calligraphy amongst many others. We also stock two very good FairTade companies; Namaste and Lanka Kade.